A local woman named Mrs Waters left £7,000 in her will to the Bishop of Derry to found a home for the poor of the city which was then usually referred to as Londonderry. In 1891, "Sunnyside", a property in Bishop Street, was bought for the purpose and the running of the home was handed to the Sisters of Nazareth, who took up residence in February 1892. The official opening of the establishment, known as Nazareth House, took place on 2 March 1892. As was usual with Nazareth Houses, the home accommodated the aged and destitute poor, together with orphan, deserted or "incurable" Roman Catholic children. Children were admitted from the age of two, with girls able to stay until the age of 14, while the boys were moved elsewhere at the age of 7. From 1922 to 1982, the Sisters operated a separate home for boys at Termonbacca and the Bishop Street home being used just for the girls. In 1898, the some adjoining land was purchased and the home was extended. A primary school was established on the premises which was also used by local children. The main Bishop Street building had classrooms, bathrooms and playrooms on its ground floor, a nursery on the first floor, and dormitories on the upper two floors, in each of which up to 40 children slept. In the 1970s, the dormitories were converted into apartments so that the children could be housed in "family" groups, although for some years afterwards main meals continued to be eaten all together in the main dining room. The children's home ceased operation in 1998. It has been estimated that through its lifetime, the home houses a total of 2,347 children, with between 60 and 100 in residence at any one time. Provision of residential care for the elderly continued until September 2013, following a review of the facility by independent consultants and 18 months after the publication OF the findings of an inspection carried out by Regulation and Quality Improvement Authority (RQIA) into the quality of management at the home. 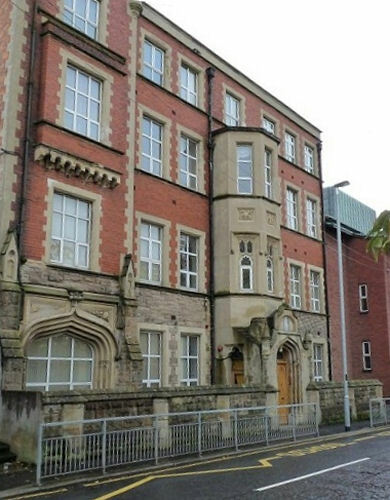 In 2014, the Derry Nazareth Home was one of thirteen institutions examined by the Historical Institutional Abuse Inquiry. Early on in the proceedings, lawyers issued apologies on behalf of the Sisters of Nazareth for any abuse residents had suffered while living in homes that they ran.